You’ve heard it before: backup, backup, backup. You’ve also heard how you should back up to a bootable clone, using software like Super Duper or Carbon Copy Cloner, and have another backup from which you can retrieve individual files, like Time Machine. Finally, you should also have your files backed up off site. I recently purchased a one year subscription to CrashPlan for my off site backup. I immediately told the software to upload my entire hard drive. Twelve days later it finished. Oh how I wish I had read Take Control of CrashPlan before I clicked the upload button. 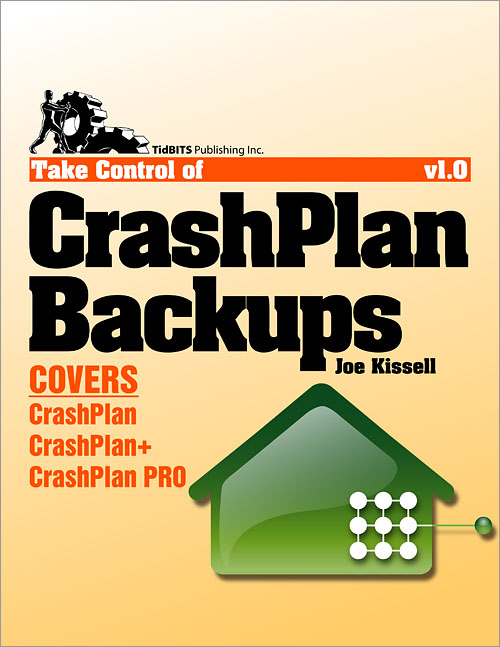 Take Control of CrashPlan is another gem in the Take Control series of books published by TidBITS. Joe Kissell has written many of the Take Control books, each thoroughly researched and written for users with any level of computer expertise. Kissell covers CrashPlan for consumers and businesses, as well as versions for Mac, Windows, Linux, and Solaris platforms. If you’re new to CrashPlan read the book from start to finish. If you’ve already backed up your computer with CrashPlan, check out the CrashPlan Quick Start on page seven and jump to the section you’re most interested in. In both cases you really should read the book in front of your computer with the CrashPlan application open so you can follow along; it will make a lot more sense this way. As I read Take Control of CrashPlan I tweaked settings and realized how intense CrashPlan really is! Every facet of CrashPlan is covered in Take Control of CrashPlan, from understanding CrashPlan basics to setting up a CrashPlan backup to restoring data to customizing settings. There’s even a section of how to use CrashPlan with mobile devices. Did you know that you can back up your data to multiple locations? Did you also know that you can group various files and folders into backups sets, each with its own settings and destinations? I’ll bet you had no idea that a friend can back up her computer data to your computer. Backups are personal; the type of data I want backed up numerous times may not be important to someone else. That said, Kissell never preaches that his way is the only way. He discusses the different options and preferences users have in each section of the software, and explains why one choice may be better than another. What gets backed up is still, ultimately, the user’s decision. For example, Kissell recommends not backing up the Applications folder. I decided to include it. Personal choice. After I started my CrashPlan backup, a thought entered my mind that scared me a little: what happens when I buy a new computer or change the hard drive? Will I lose everything and have to start all over again? Relax. Simply turn to page 79 of Take Control of CrashPlan. Kissell details the steps for the new computer to “adopt” the old computer’s backups. What did I learn from reading Take Control of CrashPlan? Plenty! Did I really need to back up apps and music? No. Did I need to back up my 8000+ photos? Absolutely! I also learned that while my MacBook backup is securely living on CrashPlan servers, there may be a time when I’ll need a local copy of a backup. As soon as I get a dedicated external hard drive I’ll have CrashPlan back up pretty much my entire drive—including apps and music. My comfort level is knowing everything is backed up at least once. Again, personal choice. I’ve read a number of Take Control books and I have yet to be disappointed. Take Control of CrashPlan is a book that will stay on my iPad. I’ll be referring to it again and again.